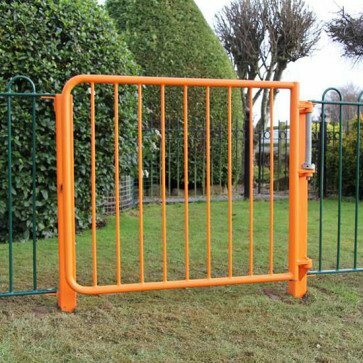 All our Premier Self Closing Gates are supplied 1.2m wide with options for 1m and 1.2m high. These are supplied with posts and self-closing mechanism, galvanised and is polyester powder coated in various colours. Routine and Operational Inspection and Maintenance Schedule. When correctly installed and maintained, our self -closing gates will give a trouble free serviceable life. These gates can be frequently used, but unfortunately attract a high degree of abuse and vandalism. We recommend that these gates are inspected and maintained on a fortnightly basis. Inspection and Maintenance Schedule. Check closing momentum (Slow and gentle closing action). Check all fixing bolts are secure. Check the spring for any breakage. Check that the stainless steel wedge stop is secure. Check the gate posts for free movement. Check that the rubber stop on the post is secure. Generally check the gate structure for deformation or weld failure due to vandalism. Easy-gate Self Closing Pedestrian Playarea Gate.